The Andaman Islands, with their pristine beaches, lush forests and fascinating history are a traveller’s paradise. The perfect destination for a quick getaway or a long break from the bus, the Islands are known to rejuvenate many a weary soul. Discover the Andaman Islands and its intoxicating charm with our Andaman holiday packages. The Andaman Islands are a group of islands in the Bay of Bengal between India, to the west, and Myanmar, to the north and east. Most of the islands are part of the Andaman and Nicobar Islands Union Territory of India, while a few in the north of the archipelago, including the Coco Islands, belong to Myanmar. The archipelago consists of over five hundred islands but you are legally permitted to visit only a dozen on your Andaman trip. It is the perfect destination for soaking up the sun, exploring colourful coral reefs and hiking through dense tropical jungle. Your Andaman honeymoon package will add a dash of romance to your holiday with romantic walks, candle lit dinners, and stunning landscapes. The islands boast of breathtaking natural beauty as well as a storied past, both of which you will experience with our Andaman tour package. The Andaman Islands have been inhabited for several thousand years with many ancient tribes still residing on some remote islands. Most Andaman holiday packages will steer clear of these tribes as they are protected by the Indian Government. The islands were used as a penal colony during British rule in India. Your Andaman tour package will include a tour of the Cellular Jail also known as Kaala Pani, in Port Blair. The jail was used to house exiled political prisoners such as Yogendra Shukla and Vinayak Savarkar as well mutineers in the 1857 Sepoy Mutiny. You can tour the facilities and watch a sound and light show on the history of the jail on your Andaman trip. Despite the popular image of turquoise waters and white sand beaches, Andaman is more than just that. Choose Andaman packages that include a trip to Baratang Island. The island is known for its bubbling mud volcanoes formed by underground natural gases and winding limestone caves that will be a great addition to your Andaman honeymoon package. Baratang Island is also home to the Jarawa people, an indigenous tribe that has lived on the Andaman Islands for thousands of years. You might spot members of the tribe on your Andaman trip on the outskirts of the Jarawa Tribe Reserve. We also recommend visiting Mayabunder in Middle Andaman Island, one of the most popular tourist attractions on the Islands. The town is known for its tidal creeks and acres of mangroves as well as Karamatang Beach that is a known for its nesting turtles. A great way to celebrate your honeymoon would be by kayaking through the magical mangrove creeks. Our Andaman honeymoon packages let you to paddle through the serene creeks amid the chirping of birds and discover the town. Another great activity to include in your Andaman honeymoon package would be dolphin watching. Head to the Havelock Islands or North Passage and board a boat that will take you to the bay to watch dolphins frolic in the warm waters. No visit to the Andaman Islands would be complete without a trip the most beautiful beach in India. Radhanagar Beach in Havelock Island is frequently crowned the best beach in the country because of its crystal clear waters, fine sands and dense jungle. Enjoy a swim in the ocean or sun bathe on the beach. You could even trek through the hills that surround the cove. We also suggest making a drive down to Elephant Beach a part of your Andaman tour package. Snorkeling and scuba diving are both popular activities that you should try on Andaman holiday packages. The beach is blessed with vibrant coral reefs and wild life that make for a mesmerizing experience. You could also hike through the surrounding mangroves and marshland for an amazing Andaman honeymoon package. The Andaman Islands are known for their watersports and adventure sports facilities. On your Andaman trip, enjoy scuba diving, snorkeling, parasaling, kayaking and sea walking. If you’d rather stay dry on your Andaman trip, explore the aquatic life in the Bay of Bengal on a glass bottom boat or a semi submarine. Most Andaman holiday packages also include a cruise on the MV Island Explorer. A restored ship built in the South East Asian style; it takes you on a two island cruise to Ross Island and North Bay Island. Enjoy the views from the Sun Deck and a delicious welcome drink on the Island Explorer. This cruise is the highlight of many Andaman holiday packages. A great way to enjoy the beauty of the islands is from above. You could hire a sea plane or helicopter on your Andaman tour package to see the islands like never before. Enjoy a bird’s eye view of the historic Cellular Jail, Ross Island, North Bay Island, Mount Harriet and Sailing Ships during your flight. Seaplanes are often hard to come by so we suggest taking a helicopter instead. While a chopper cannot land on water and take you as close to the surface as a sea plane, it is still a great addition to Andaman packages. While on Port Blair, take a trip down to Chidiya Tapu. A rugged, unspolit alternative to the more popular beaches on the islands, Chidiya Tapu is known for its primal natural beauty, untouched by rampant tourism and commercial activity often ignored my many Andaman packages. We recommend a visit to the Chidiya Tapu Biological Park. A bird watcher’s paradise, the park is a fantastic spot for picnics with the family or a leisurely traipse on your own as you spot exotic birds and enjoy their musical chirping. If you feel adventurous, you could make a trek to the Munda Pahad Mountain a part of your Andaman tour package. The scenic hike up to the summit is a surreal experience with the blue sea visible through the trees. This trail is off the beaten path of most tourists but certainly worth the effort. Chidiya Tapu draws most of visitors at dusk as they descend on the beach to watch the sunset. Luck or unlucky visitors, depending on how you look at it, could even spot crocodiles on the beach foraging for food. Head to Waves or Brewberrys after your excursion for an authentic local meal on your Andaman tour package. 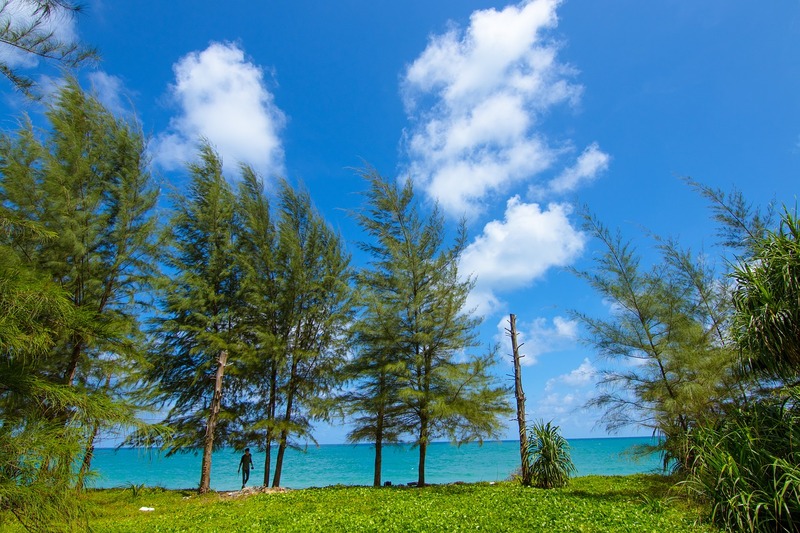 The uninhabited islands of the Andaman archipelago are often neglected by Andaman packages despite enjoying some of the most breath taking landscapes on the planet. One such uninhabited island is the unimaginatively named Barren Island. Barren Island is dominated by Barren Volcano, the only active volcano on the Indian subcontinent. Its last major eruption was in 2017 and but you can often see smoke spewing out of the volcano. The island’s only inhabitants are goats, rodents and several species of birds. Barren Island is a premier scuba diving destination frequented by Andaman packages and one of the best in the world owing to the crystal clear waters surrounding the island. You can often see manta rays, coral gardens and lava formations on the ocean floor that making diving around Barren Island on Andaman packages an incomparable experience. If you head south, you could also pay a visit to the rubber plantations that are spread across the island and learn how rubber is produced. Plantation tours also include trips to coconut, beetle nut, cinnamon and clove fields that offer a welcome break from the sun and sand on your Andaman tour packages. The Andaman Islands are like paradise on Earth with heavenly beaches, forests and enchanting natural beauty. With our Andaman packages you will see a side of your country that you have never seen before; a pristine, unblemished land blessed by nature and history.